Railpictures.ca - Bill Thomson Photo: CN train #628 with FPA4 6778 is stopped at Guelph Station in the Summer of 1962, with the lead unit still dressed in the yellow, green and black “1954 scheme” colours. Delivered in 1959, the MLW FPA4 and FPB4 fleet only had 2 years before the CN noodle and zebra stripes were first introduced in 1961. By 1963 only a few FPA4′s remained in the 1954 scheme, and by 1965 only one (6765). [Editor's Addition: According to a timetable from that era, CN train 628 was a daily (except Sunday) morning eastbound passenger train for Toronto via the Brampton Sub (later divided into parts of the Guelph, Halton and Weston Subs), arriving at Union Station in mid-morning.] | Railpictures.ca – Canadian Railway Photography – photographie ferroviaire Canadienne. 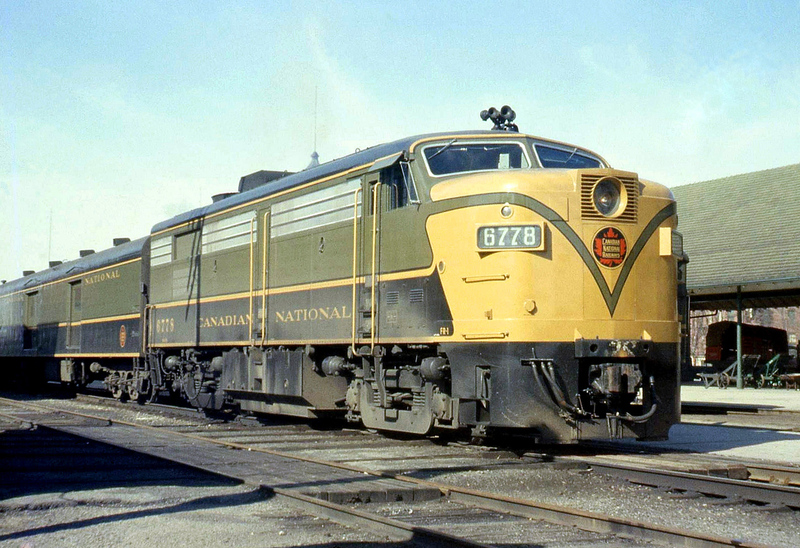 Caption: CN train #628 with FPA4 6778 is stopped at Guelph Station in the Summer of 1962, with the lead unit still dressed in the yellow, green and black "1954 scheme" colours. Delivered in 1959, the MLW FPA4 and FPB4 fleet only had 2 years before the CN noodle and zebra stripes were first introduced in 1961. By 1963 only a few FPA4's remained in the 1954 scheme, and by 1965 only one (6765). In my opinion, the 1954 scheme was the CNR’s most handsome! I am from, and currently reside in, Guelph, and I can say, the station area does not look like this now. It’s too bad the MLW FPA-4s were retired, they are beautiful engines. In a few years,she,ll be red,what a shame!